Need a mailbox replacement or upgrade? Otto’s Streetscape Solutions has the perfect mailbox for your needs. Our custom mailboxes are available in small, medium and large sizes, capable of meeting your mailing bulk requirements. In addition to matching you with the perfect size, we’ll match you with the perfect color. With a wide range of colors available, you can choose the color that best compliments your neighborhood, home or other business. 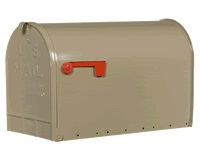 Browse our selection of mailbox sizes and colors here.